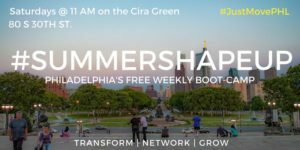 Join us every Saturday morning on the Cira Green at 11 AM for a fun-filled and challenging boot camp experience on the Cira Green hosted by Core Aesthetics and sponsored by Evo Philly Exclusively open to all Evo residents but also open to the general public with early registration on Eventbrite link provided! – World class fitness instructors! Come sweat with us! You won’t regret it!